My last book for 2014 was actually Zola’s The Belly of Paris but at the moment things are a bit discombobulated chez ANZ LitLovers for one reason and another – so that review will have to come later… Noontide Toll by Anglo-Sri Lankan author Romesh Gunesekera has been short-listed for the DSC Prize for South Asian Literature, and I think it is my favourite of those I have read so far. Narrated by the ruminative van driver Vasantha in a linked sequence of vignettes, Noontide Toll is a meditation on life in Sri Lanka as it comes to terms with the trauma of its recent past: the 2004 tsunami, and the end of the brutal civil war. Every time I drive across the causeway to Jaffna, I feel I am entering another country. The lagoon is as big as a sea. The sky touches it at the edge, on the left, and on the right, and the wind makes the ripples look like waves. The fellows at the checkpoint know me so well now that they don’t even look at my ID. They crack a couple of jokes about the state of my van and laugh their heads off. I tell them it is a Japanese van. In 1945, Japan was a dump. Nobody thought the Japanese could make even a cup of tea any more, but now Toyota is the biggest car company in the world. It’s a funny business, I tell them. No one knows who will have the last laugh. Look at Germany, same thing. German tourists are rolling in it now. Their chancellor is the boss of Europe. It makes you wonder about this business of defeat and victory. ‘Yes, miss. Like you say, I am lucky to be here.’ He paused, not sure whether he should disturb the eager couple with any more talk about himself. Then, as if unable to stop the flow, he added, softly, ‘I survived the tsunami.’ I heard her take a sharp breath. ‘Here?’ ‘Just nearby.’ He switched the flashlight on again and indicated the mean curve of the beach. ‘We had a house over there. It went with the wave. They all went, my wife, my daughter, my son, my mother, my brother and all his family and my uncle’s family. All twenty-two of them. All except me. Big bad wave.’ The breeze dropped. The sea seemed to have flattened before his words. Nothing broke the surface. No turtle heads bobbing up. There were no flippered domes on the wet sand. No sign of them at all. Yu’d think there was no life left anywhere in the water. ‘I am so sorry,’ Eva said, standing very still. Right at the edge of the horizon I could see the tiny yellow light of a fishing boat. ‘But you are right, miss,’ the man said. He kicked some sand down towards the sea. ‘In this world, we must be the lucky ones if we survive from one day to the next’. Vasantha has an optimistic outlook and a wry sense of humour but the book has a melancholy tone, with an ever-present sense of menace. In the south the beauty of the sea is tempered by knowledge of its awesome power to destroy, and in the north the menace arises from the constant presence of armed guards at checkpoints and the ruined buildings. Among the signs of renewal and recovery, over-riding the brisk energy of marketers and the plastic smiles of the emerging hospitality industry, are the damaged. From a resentful disabled young man to a genial war criminal everyone seems to have a past that they can’t shake off. They are being told they need to ‘move on’, but civil wars mean that every interaction with a stranger is fraught by doubt: which side were you on? Can a man take the risk of telling his beloved that he killed her brother? Will guilt and fear of exposure poison the relationship anyway? Ironies abound. Miss Susila, making a pilgrimage to the old colonial home of Leonard Woolf, is devastated to learn that its shabby remains are to be renovated beyond recognition, modernised for ‘tomorrow’s visitors, not yesterday’s tiffin-tuckers’, but she isn’t willing to donate her books to an old man trying to set up a library for the community. The author isn’t judgemental about her obsession with this English author, but the poverty of the locals in all the stories shows up the self-indulgence of the tourism industry. Here in Australia we are turning away asylum seekers from Sri Lanka because, our leaders tell us, the war is over. But as Noontide Toll shows, the scars of a civil war take a very long time to heal. Sounds very interesting. We had a visiting Sri Lankan-Canadian writer speak at the library here this year and I read a few of his books. He actually spends half a year back in Sri Lanka where one of his projects is called “Write to Reconcile”. Canada and Australia were the two countries who opened their doors to Sri Lankan refugees in the late 70s and I don’t know but I would not be surprised if the brakes have been put on here too based on similar arguments. Shyam Sevadurai. His latest novel The Hungry Ghosts (2013) was a finalist for the Govenor General’s Award the year it went to NZ’s Eleanor Catton based on her being born here I suppose. Thanks, I’ll add it to my wish list. Am I right in thinking that Amitav Ghosh also had a book with the same title? I wonder if there’s a cultural symbol lying behind their choice, something from mythology maybe? PS (a bit later, answering my own question) hungry ghosts come from Buddhist myth, where the dead may be reborn as “hungry ghosts”— spirits with stomachs so big they are insatiable. This happens if they have desired too much during their lives so their living relatives have to free them by with good karma! Oh yes, the hungry ghost is a Buddhist myth that haunts the grandmother in this book. There are variations I think but here a greedy person is reborn as a being with an insatiable hunger and a tiny mouth through which all food turns to feces. The karmic bonds between grandmother and grandson form the backbone of this book. It is a very rich and sensuous tale that moves back and forth between Sri Lanka and Canada, a little richer than my normal tastes but I enjoyed it. Goodness, that is *cold*, a bit of a contrast with Melbourne today where it’s 41 degrees C! Outside, that is, not inside here in my nice cool house. It’s so well insulated that I’ve only just put the AC on now, even though with our solar power on the roof we can use it as much as we like and it won’t cost us a cent. But the cool change is on its way, I can hear the wind freshening outside which will be making things harder for the fire-fighters out in the bush. What heroes they are, these volunteer men and women who do this hot and dangerous work! 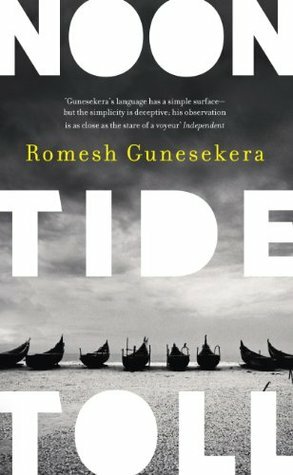 I really enjoyed Gunasekera’s Reef a few years back, and judging by your review Lisa, Noontide Toll should join the TBR pile. It sounds like a good companion read to Questions of Travel? Yes, I hadn’t thought of that. It’s quite different in style but they would make good companions…. I think I’ll add reef to my Wishlist too: I saw very positive reviews about that one at Good Reeds. I have been trying to tackle the TBR before adding to it, but adding something to a wishlist can’t hurt, eh? Even though ANZ LitLovers may be a little ‘discombobulated’ at the moment, please know that you have provided years of vicarious and actual reading pleasure based on your reviews, Lisa. Your writing is brilliantly erudite, incisive yet detailed, and so eclectic. If I’ve been told, heard or read of a book, I always check whether you have reviewed the title to see whether it is worth pursuing, because your opinion concurs with mine. And that’s not my being patronising or arrogant, it is highly praising you. Many thanks. Thank you, Heather, that is so kind of you and you have made my day. Things are a bit awkward right now but I find that reading and writing and chatting to lovely people like you takes my mind off my worries, so I’ll be doing my best to keep posting here as much as I can.